Week 1 is here! I kept it short and sweet this week - why we're going to stay light and playful about a topic that can feel SO HEAVY. You meditation for the month is going to be EEEAAASSSSYYYY. Set an intention for the month: what is it you are hoping for this month? What are you hoping to get from the Collective? The new moon (happening on Wednesday - though you can do this any day this week) is THE PERFECT time to set intentions. How to do it? Gather a piece of paper, pen, and a candle, if you have one. You can also burn some sage or diffuse essential oils. Get as fancy/un-fancy as you want. Let your intention flow! WRITE IT DOWN! Allow yourself to dream really BIG! Get carried away in very descriptive detail of what you most deeply desire. The magic is in the details remember, so you want to get super-clear about every little thing you want to start showing up in your reality. Once you have your intention scribbled on a piece of paper, I want you to set aside 3-5minutes a day to meditate on it. That can look many ways - repeat it over and over for a few minutes, visualize it for 3-5 minutes, say it once and then just breath for 3-5 mins, etc. You choose what feels most right to you! 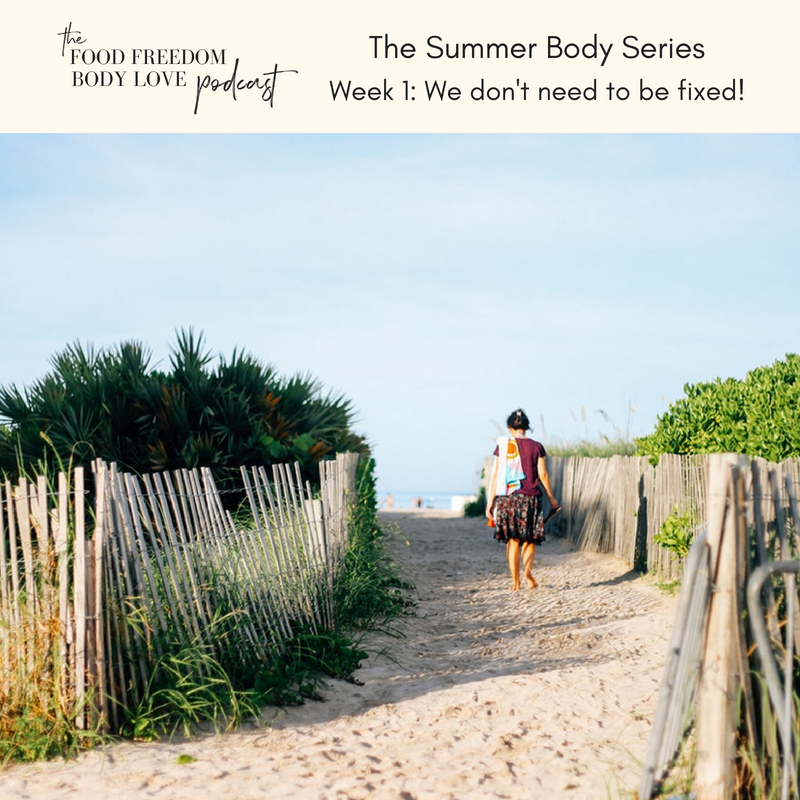 The first installment of The Summer Body Series - to accompany this month's theme - is LIVE!!!!!!! Week 1 is all about what the series is, what it's not, why we are NOT focused on fixing ourselves and where we should put our attention instead. It's about the realities of living in a body you may not love WHILE living in a magical, incredible, miraculous season of memory-making and unabashed excitement. It's about tasting the ripe peach, savouring the waffles, smelling the lilacs, listening to the Stevie Nicks and finding more and more and more beauty in the most common and mundane of places. You aren't gonna want to miss this! Each week of this month I'm going to challenge you to do 3-5 activities to increase your ability to see beauty in yourself and others, to feel beautiful, to experiment with beauty, to try new forms of beauty on for size. Try what you want and leave the rest!!! 1. GET EXCITED!!! Remember that feeling you used to get - the flutter in your tummy, the glow, the surge of energy - when you were first falling in love, or going out on a Friday night, or having a first kiss, .......or starting a new diet??? Remember how beautiful and magnetic you felt in that state?? Welp, I want you to find that feeling again - without the diet/restriction/Tinder hell. Ha! Make a desire board - on your wall or on Pinterest that holds all the thing that make you feel ALIVE!!!! Take your time with this, it doesn't have to be perfectly done over night. Allow yourself time to play around with it. 3. Post a picture of your make-up and filter free face. Bonus points if you find a moment when you are feeling beautiful and take the pic then. I want to see YOU! 4. Go out and buy yourself one beautiful beauty product. I don't care what it is - skincare, make-up, hair care. Cheap, expensive, whatever. Just something that you've been wanting or to scared to try. I'm going to FINALLY find a bright colour of lipstick that suits me and actually wear it out in public!! GAH!!!!! I'm terrified just writing it!!! 5. Buy yourself some fresh flowers for your home. A little bit of instant beauty!